Whenever the topic of “healthy eating” comes up, the high cost of organics is sure to follow. In fact, many people today are eating sub-optimally due to lack of understanding that it is possible to enjoy healthy meals every day without going broke. The cost of buying healthy foods can scare people so they avoid it altogether. If this is how you've been feeling, then you will be happy to know that you are not alone. Here are several tips that could help you save money and enjoy the healthy food (including organic) that many consider out of reach. One of the major reasons why many people do not eat healthy has to do with poor planning. Many will either buy grocery in small bits and this means spending more money. With a proper plan however, it is possible to consume green, healthy vegetables daily (this should be part of your daily diet anyways) if you plan well, buy in bulk and prepare your meals over the weekend ready for the freezer. The same can work for cereals. Just cook them over the weekend and once they cool down, store them in a fridge ready for the week ahead. You only need to use an oven to defrost them and with a pressure cooker, it becomes cheaper and faster to prepare your meals. You can learn more about this by visiting cookingdetective.com. It's easy to break the bank if you're eating on the fly or shopping with an empty stomach. You can save yourself a lot of pain by coming up with a clear, healthy grocery list which you should follow through every week. This will not only help you eat and combine healthy foods but also help you buy only what you need. Use the meal plan you made to develop a thorough grocery list. Plan for your breakfast, lunch, dinner, and snacks—use that awesome self control you have to stick to your plan. Use beet greens and ends to make a mineral-rich vinegar. Just put the parts you cut off into a mason jar and pour Apple Cider Vinegar over top. Add some black pepper and oregano (or any spice you like) and you'll have a delicious, healthy vinegar to use in your salad dressing. Radish and carrot greens blend well together with garlic, lemon juice, and a drop of oil (along with any spices, nuts, and cheese you like) to make an awesome pesto that you can dip in toasted bread ends or put over some pasta. As you pack your foods, make sure you have marked them clearly. This should include the dates they were cooked and refrigerated so you to know what to eat first and what can wait. Make use of your freezer for things you want to keep a little longer. Eating healthy does not mean going for elaborate meals every time, that's likely to put a lot of stress on your budget. Remember that it is possible to get all the nutrients you need from simple vegetables and cereals rather than opting for meat with every meal. Go for things like beans, sweet potatoes and fruits (especially those which are in season) for the minerals, nutrients, and energy that you need and think of those extra-special meal times as a well-deserved splurge. 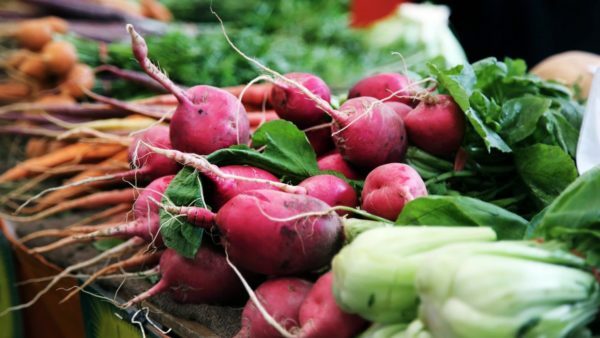 There are also options for CSAs, like Imperfect Produce, that deliver food to your doorstep for a lower cost because the grocery stores just won't sell them so they would otherwise go to waste. Buying readymade foods can prove to be costly at the end of the day. You can save the cost by making such foods on your own ahead of time. You can make your own granola, energy bars or even toasted walnuts when you have time and enjoy them while taking care of your snack cravings. Another great way of keeping your eating budget without compromising on the quality of your meals is to always grow your own food items. You can grow fresh herbs and vegetables if you have a small window (or even on your kitchen counter) and this will always help you not to make purchases from the local stores. Some of the foods you can grow include corianders, baby carrots, radishes and spinach among others. If you work far from home, the temptation of eating in a restaurant is always high. However, you can save more money and enjoy healthy foods by making some for yourself and carrying your own lunch box. Restaurant foods can be very expensive and in many cases, you're not getting the same quality as if you were to make it yourself. Eating healthy on a budget can take a bit of time to adapt to because it comes along with a lifestyle change and a new focus on food, but you don't need to go broke when doing it. Do you have your own tips for healthy eating on a budget? Tell us in the comments below!